For the last 5 weeks, I have been teaching a poetry course through Desi Writers Lounge. It is a basic, sweeping course, titled “Elements, Themes, and Form.” We have talked about things like imagery, abstraction, figurative language, and the salient themes in poetry: self-portraits and, begrudgingly, love. This is not to say that poetry is limited to these two themes. On the contrary, I feel it is the most natural form of expression for any emotion. However, when one first starts to dabble in poetry, one is, more often than not, naturally drawn towards these two themes. For the course, I have re-read some of my favorite poems and have had the pleasure of composing discussion questions based on the weekly reading. Last week we were exploring the theme of Love and Desire, and it corresponded with the highest number of assigned readings for the entire course. We read the following poems, which I highly encourage everyone to get their hands on, like, right now. All three of the course participants were also given homework, which was to write an original poem on the theme of love and desire. It was an open prompt and they were told to use the week’s reading as inspiration. I got three very different poems. 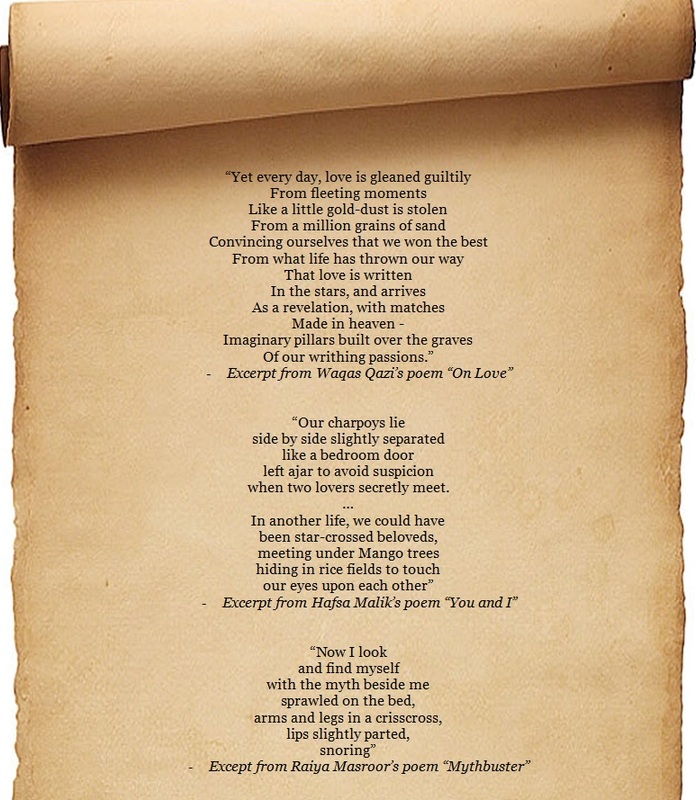 Waqas A. Qazi wrote a jaded poem titled “On Love.” He was also not a fan of the readings – a curious response as he has appreciated all the assigned poems in the past. “I don’t quite know what to make of this week’s readings. I think one needs to be in a specific kind of mood to read and appreciate romantic poetry. This has not been one of those weeks. Hence my interpretation of these poems may be quite subjective. I don’t think there is a poem here which has really impressed me yet,” wrote Waqas. I am not going to lie – the bitter honesty in his words crushed me! Lee’s “This Room and Everything in It” is one of my favorite poems and I have used it as a motif to write a poem myself, which in my opinion, is some of my more polished work. Excerpts from poems written by DWL Poetry Course participants. Click to enlarge. So, in talking about love, I did not discover anything more than I already knew. And I was reminded of the fact that I really don’t know much about love at all. Looking through my work from years ago, my very first poetry workshop to be exact, circa 2006, I found two short poems in an old chapbook. They must have been written in response to a similar prompt, a prompt related to love, which is why the poems are so succinct and, quite frankly, stiff-necked, opinionated, rigid, but at the same time, they are fascinating specimens that bring to light the state of mind of the 21-year-old Noor. I am going to leave you with these specimens now. Not my best work by any stretch of the imagination, but here it is for what it’s worth. 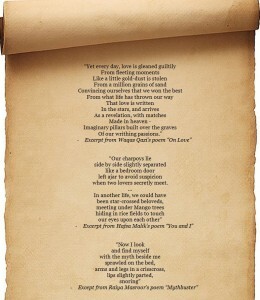 Two poems from October 2006.
than to love each other. And after the sheer humiliation that comes with posting the two poems above, I am compelled to post something recent that is more representative of my present poetic voice, loosely related to the theme under discussion. 1. The title is stolen from Raymond Carver’s excellent short story, What We Talk About When We Talk About Love. I highly recommend it! 2. This post originally appeared on the author’s personal blog, Goll Gappay – Little Matters That Matter. 1. If you’d like to join Desi Writers Lounge, a platform dedicated to coaching new writers and poets, please complete the registration form here. The writing sample is important. We do screen our applicants, so please be sure to provide one. 2. All of us at Desi Writers Lounge work very hard to create a bi-annual online literary magazine called Papercuts. Browse through our hard work and let us know what you think on the Desi Writers Lounge Facebook Page or leave comments on the webpage.